Just a little horror from the war against the civilians of iraq. But it’s crazy conspiracy theory to think that the allied and integrated multigenerational mafias that control the western empire are satanists. BTW: do you see the strategy of disintegration being used in the USA? It’s already well beyond info-psyops. The FBI-managed OKC bombing (search this site) was blamed on the media’s stereotypical mirage of bible-beating gun-hoarding white racist constitutionalists. The last word is key: the legal framework of the targeted country is the first casualty of such social engineering projects. Trump is an easy target for the controllers, but their obsession with him is strong evidence that he’s not on the inside like hillary. It’s a measure of the USA’s own advanced state of disintegration that his election was the lesser of two evils. The erosion of a target country’s integrity and viability has always been a conscious goal of the Western colonial project. Creating instability and dissatisfaction with existing reality was a necessary prerequisite to “tame” and then integrate native peoples into the dominant hierarchical model. Today, of course, we are told that colonialism is a thing of the past. The leading nations of the international community no longer seek to enslave their less fortunate neighbours, but rather pursue policies of world benefaction – within the limits imposed by healthy competition, of course. When this miraculous conversion took place we are not told, but perhaps it occurred incrementally, parallel to the increasing divide between the world’s rich and poor. In any case, a casual glance at the state of the Muslim world is enough to shatter this foolish delusion. As with 9/11, the trigger event for the War on Terror, incompetence is the preferred explanation for the nightmare scenario in Iraq today. Though counterintuitive to the domesticated populations of the West, a plan to deliberately fragment Iraq along ethnic lines is amply confirmed by the published record. Resuscitating earlier Zionist schemes, the US Council on Foreign Relations recently called for the dissolution of the “unnatural Iraqi state.” (2) On the grounds of its ethnic diversity, Iraq is said to be a false, artificial construct, a product of arbitrary colonial decisions in the early 20th century. It is a judgment that could apply to many of the world’s countries, and yet the theme is being enthusiastically adopted by reams of ‘experts’ who would never dream of questioning state sovereignty in Quebec, the Basque Country or Northern Ireland. In typical fashion, policy analyst Michael Klare recently dismissed Iraq as an “invented country…to facilitate their exploitation of oil in the region [the British] created the fictitious “Kingdom of Iraq” by patching together three provinces of the former Ottoman Empire…and by parachuting in a fake king from what later became Saudi Arabia.” (3) Accepting the Bush Administration’s bogus rationale for the invasion, Klare ascribed Sunni resistance to the desire for a bigger share of oil revenues in the future partition of the country. Missing is any idea that resistance extends beyond “Sunnis” or could be motivated by Iraqi nationalism or the need for self-determination. 2005 saw a spectacular rise in the use of car bombs, many directed against innocent civilian targets. Though the Zarqawi network was said to have no more than about a thousand men in Iraq, it apparently had an endless supply of personnel ready to sacrifice themselves for the holy war. Other accounts, however, suggest a different explanation. May 26, 2018 “Information Clearing House“ – If the neoconservatives had self-restraint, they would sit back and let America’s Fifth Column—Neoliberal Economics—finish off Russia for them. Russia is doomed, because the country’s economists were brainwashed during the Yeltsin years by American neoliberal economists. It was easy enough for the Americans to do. Communist economics had come to naught, the Russian economy was broken, Russians were experiencing widespread hardship, and successful America was there with a helping hand. In reality the helping hand was a grasping hand. The hand grasped Russian resources through privatization and gave control to American-friendly oligarchs. Russian economists had no clue about how financial capitalism in its neoliberal guise strips economies of their assets while loading them up with debt. But worse happened. Russia’s economists were brainwashed into an economic way of thinking that serves Western imperialism. For example, neoliberal economics exposes Russia’s currency to speculation, manipulation, and destabilization. Capital inflows can be used to drive up the value of the ruble, and then at the opportune time, the capital can be pulled out, dropping the ruble’s value and driving up domestic inflation with higher import prices, delivering a hit to Russian living standards. Washington has always used these kind of manipulations to destabilize governments. Neo-liberal economics has also brainwashed the Russian central bank with the belief that Russian economic development depends on foreign investment in Russia. This erroneous belief threatens the very sovereignty of Russia. The Russian central bank could easily finance all internal economic development by creating money, but the brainwashed central bank does not realize this. The bank thinks that if the bank finances internal development the result would be inflation and depreciation of the ruble. So the central bank is guided by American neoliberal economics to borrow abroad money it does not need in order to burden Russia with foreign debt that requires a diversion of Russian resources into interest payments to the West. As Michael Hudson and I explained to the Russians two years ago, when Russia borrows from the West, the US for example, and in flow the dollars, what happens to the dollars? Russia cannot spend them domestically to finance development projects, so where do the dollars go? They go into Russia’s foreign exchange holdings and accrue interest for the lender. The central bank then creates the ruble equivalent of the borrowed and idle dollars and finances the project. So why borrow the dollars? The only possible reason is so the US can use the dollar debt to exercise control over Russian decision making. In other words, Russia delivers herself into the hands of her enemies…. “Now, that is what Henry Ford wants to prevent. He thinks it is stupid, and so do I, that for the loan of $30,000,000 of their own money the people of the United States should be compelled to pay $66,000,000 — that is what it amounts to, with interest. People who will not turn a shovelful of dirt nor contribute a pound of material will collect more money from the United States than will the people who supply the material and do the work. That is the terrible thing about interest. In all our great bond issues the interest is always greater than the principal. All of the great public works cost more than twice the actual cost, on that account. Under the present system of doing business we simply add 120 to 150 per cent, to the stated cost. “But here is the point: If our nation can issue a dollar bond, it can issue a dollar bill. The element that makes the bond good makes the bill good. The difference between the bond and the bill is that the bond lets the money brokers collect twice the amount of the bond and an additional 20 per cent, whereas the currency pays nobody but those who directly contribute to Muscle Shoals in some useful way. ” … if the Government issues currency, it provides itself with enough money to increase the national wealth at Muscles Shoals without disturbing the business of the rest of the country. And in doing this it increases its income without adding a penny to its debt. It is absurd to say that our country can issue $30,000,000 in bonds and not $30,000,000 in currency. Both are promises to pay; but one promise fattens the usurer, and the other helps the people. If the currency issued by the Government were no good, then the bonds issued would be no good either. It is a terrible situation when the Government, to increase the national wealth, must go into debt and submit to ruinous interest charges at the hands of men who control the fictitious values of gold. Look at it another way. If the Government issues bonds, the brokers will sell them. The bonds will be negotiable; they will be considered as gilt edged paper. Why? Because the government is behind them, but who is behind the Government? The people. Therefore it is the people who constitute the basis of Government credit. Why then cannot the people have the benefit of their own gilt-edged credit by receiving non-interest bearing currency on Muscle Shoals, instead of the bankers receiving the benefit of the people’s credit in interest-bearing bonds? Russia and the USA have a common enemy which threatens their very existence, the invisible empire. Isn’t it time to make common cause with a natural ally which helped us through both the revolutionary and civil wars? With very few exceptions down the ages, discussions in moral philosophy – the study of right conduct – have failed to systematically investigate the origin, nature, and course of evil in a manner free from supernatural imaginings. Evil was often considered something to be endured rather than something that could be understood and eliminated by rational measures. And – as Lobaczewski demonstrates – the origin of evil actually lies outside the boundaries of the conventional worldview within which the earlier moral inquiries and literary explorations were conducted. Evil requires a truly modern and scientific approach to lay bare its secrets. This approach is called “ponerology”, the study of evil, from the Greek “poneros” = evil. The original manuscript of this book went into the furnace minutes before a secret police raid in Communist Poland. The second copy, painfully reassembled by scientists working under impossible conditions of violence and repression, was sent via courier to the Vatican. Its receipt was never acknowledged – the manuscript and all valuable data lost. In 1984, the third and final copy was written from memory by the last survivor of the original researchers: Andrew Lobaczewski. Zbigniew Brzezinski blocked its publication. Political Ponerology is a study of the founders and supporters of oppressive political regimes. Lobaczewski’s approach analyzes the common factors that lead to the propagation of man’s inhumanity to man. Morality and humanism cannot long withstand the predations of this evil. Knowledge of its nature – and its insidious effect on both individuals and groups – is the only antidote. You and I, meaning Normal People, we look at our Thought Leaders, our Media and Cultural Overlords, our Ruling Class, and oftentimes wonder how they can be so venal and dishonest in pursuit of what they want — and what they want most of all is control over the lives of us Normal People, those of us who do not want to control anyone. We just want to be left alone. How many times have we asked, How do they live with themselves? All the lies they tell, the innocent people they destroy, the fake news they publish, the character assassination, the stoking of racial conflict, the hate campaigns, the advocating of violence, the unending cultural bigotry against those of us just minding our own business… How do they sleep at night? Maybe, thanks to the dribs and drabs that have bubbled up over the past year, we are starting to have that question answered. The latest revelation surrounds Sally Quinn, the surviving widow of Ben Bradlee, the Washington Post’s powerful executive editor from 1968 to 1991, who then served as the paper’s vice president until his death in 2014. For nearly 50 years, the entire social and political world of DC revolved around this couple. Bradlee and Quinn were the New Camelot (his career took off in large part because of his friendship with John F. Kennedy), the Gatekeepers of who was in and who was out, the Elite Deciders among our Ruling Class with the extraordinary power of the Washington Post, and by extension the rest of the mainstream media, to abuse and weaponize their will against the rest of us. Quinn’s other acts of admitted wickedness include plotting to break up Bradlee’s marriage (which she did) and using the threat of adultery to bend Bradlee to her will. See www.KerthBarker.com for more insight into “What is going on here?” Don’t be an ostrich. Pizzagate, pedophilia, cannibalism, the occult, witchcraft, satanism, luciferianism is alive and well in the highest eschelons of society, in NY, DC and Hollywood (for starters)… It’s a much more complicated world than we were led to believe. It appears that “drain the swamp” might mean something like “cast out demons”? Please watch, comment and “Like” – and subscribe to Kerth’s YouTube channel. 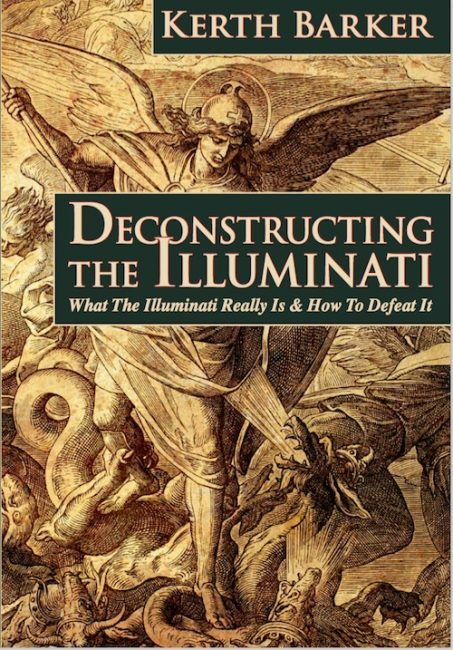 Read Kerth’s books (see KerthBarker.com) and you will learn even more Illuminati secrets. In 1991, the Centers for Disease Control published a study showing that the nation’s taxpayers would save $60 billion in health-care and special-education costs by spending $32 billion to eradicate lead from inner city homes. Congress has never been willing to adopt this cost-effective prevention strategy, evidently preferring to produce generation after generation of black inner city children with diminished intellectual capacity and a propensity toward violence. Children, can you spell R-A-C-I-S-M?